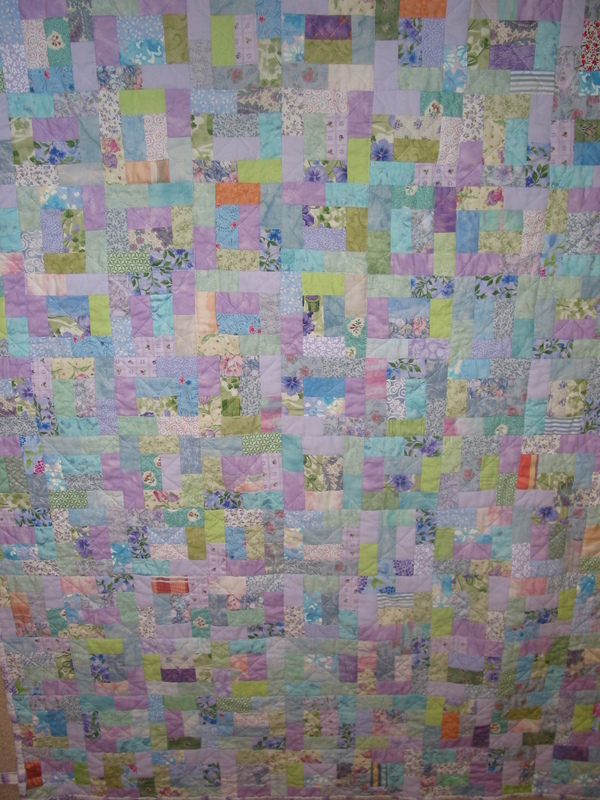 The photo shows a reasonably close view of the "tiny blocks". These were done with the 1 1/2" BY 2 1/2" bricks. 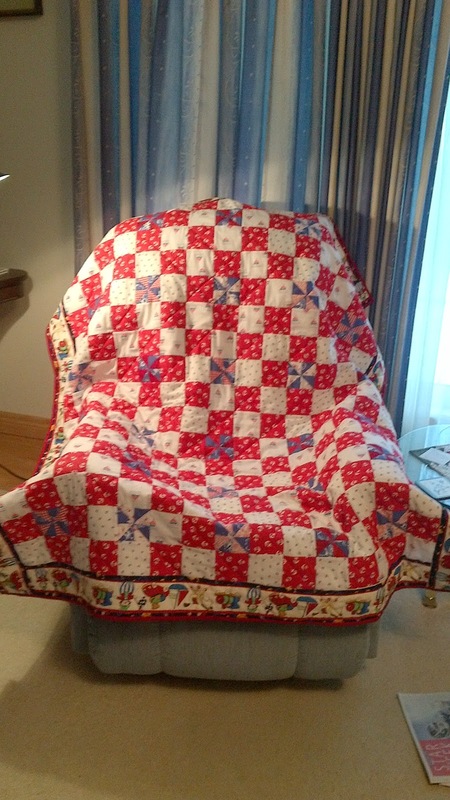 My sister wanted a wheel chair quilt for a friend of hers so the over all quilt is 36" by 44". 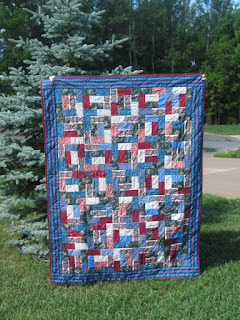 I have not made a quilt for that specific purpose before so I have requested feedback. I also added ties near the top. As the year winds down I tend to look back before looking forward. I have accomplished a lot but there is always more to do. 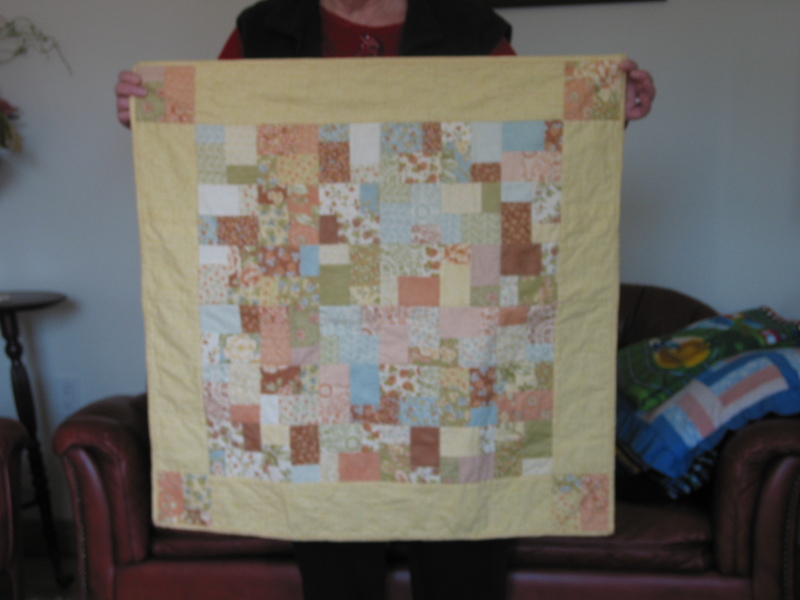 For two years now I have managed to make the 50 quilts from stash challenge. I think after looking things over I will try for what the sports fans call a threepeat. I am certain there is no such word. There are a couple of interesting looking BOM's and quiltalongs coming up. I am considering them but do not want to create more UFO's. I will add the buttons to my side bar once I have firmly joined in. Traceyjay offered this quiltalong a couple of months ago. 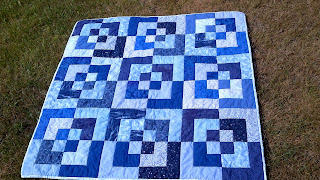 I actually finished it in time for the linky party. 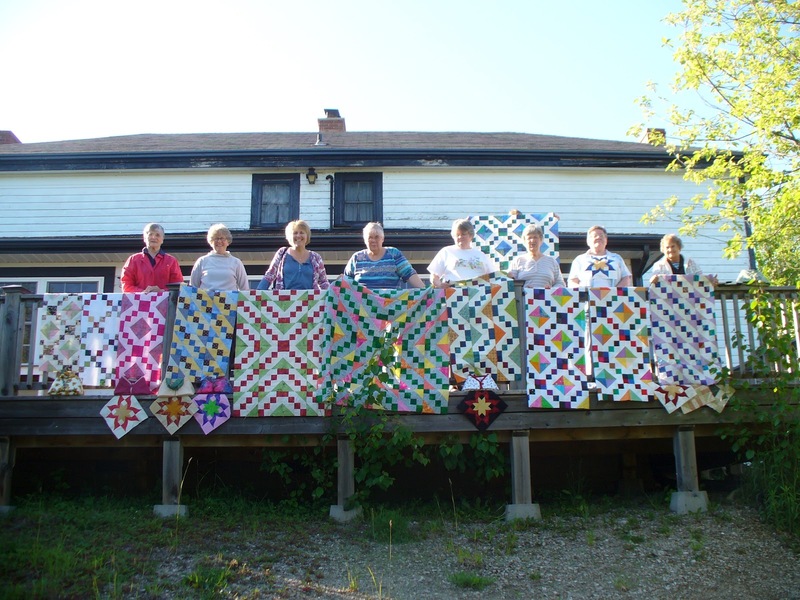 This quilt will be a Project Linus donation quilt for the Kincardine Sunset Quilters Guild. 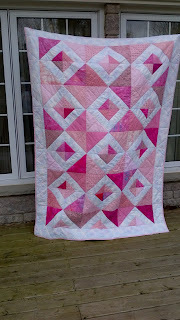 It made a dint in the pink collection but that one seems to keep getting replenished. The guild meeting was this week. 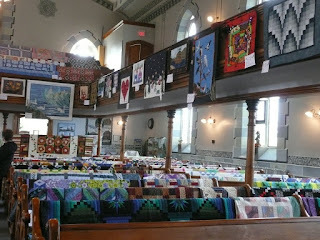 Prizes from the quilt show were handed out and all the normal activites took place. 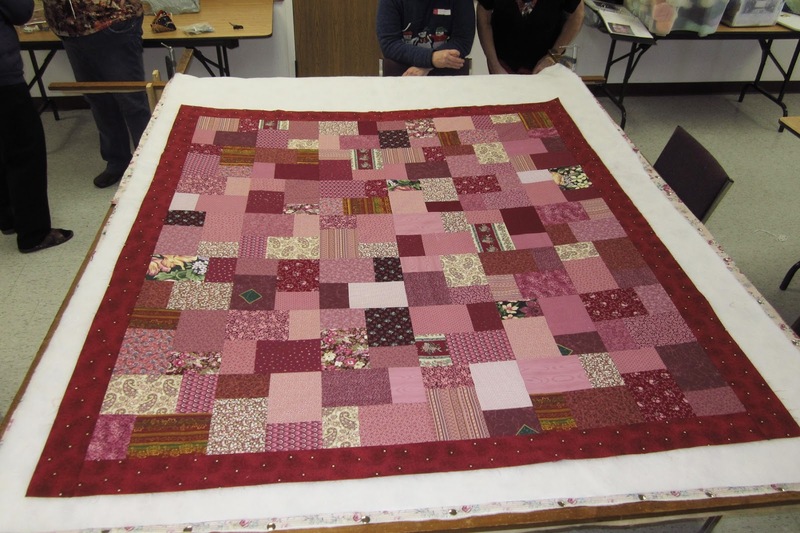 The Past Presidents challenge was "issued". It is a crayon colour challenge. We had to reach into a black bag and take a crayon. 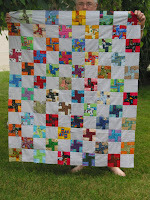 Then using that colour and its complement we are to come up with a quilt design by the end of April. That should really say a finished quilt by the end of April. Friday evening and Saturday I went on the local Christmas homes tour with my next door neighbour and her daughter's Mother in Law. We had a great time and saw many beautiful homes that were also beautifully decorated. Kind of puts you in the mood. Christmas is no longer strictly red and green. It has been a busy quilting week. 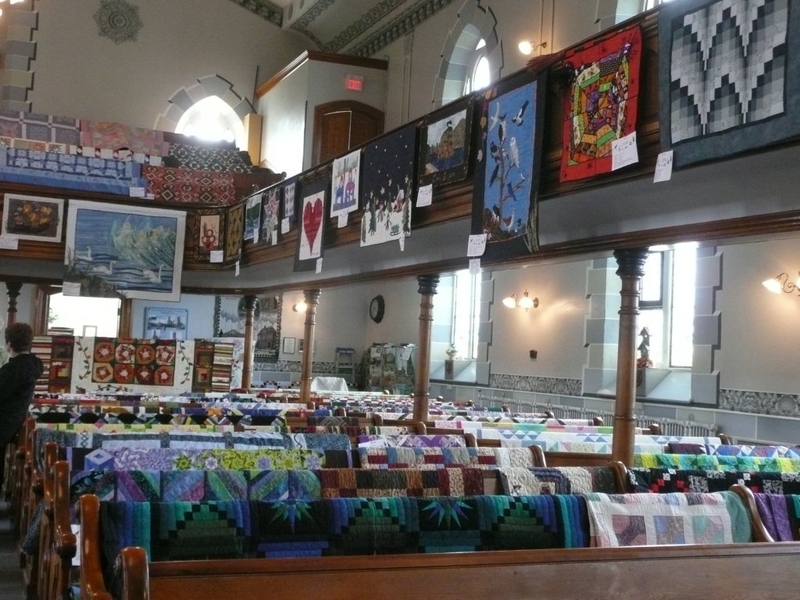 The show was a tremendous success on all sides. And we had terrific coverage in the local press. 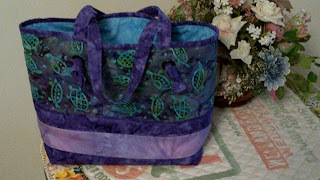 Then Wednesday our Scrapbag Quilters group met. 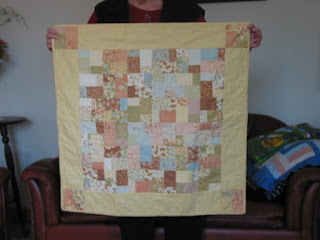 Cathy did the project for us this time and I got a kit with manly browns, greens and some earthy prints. 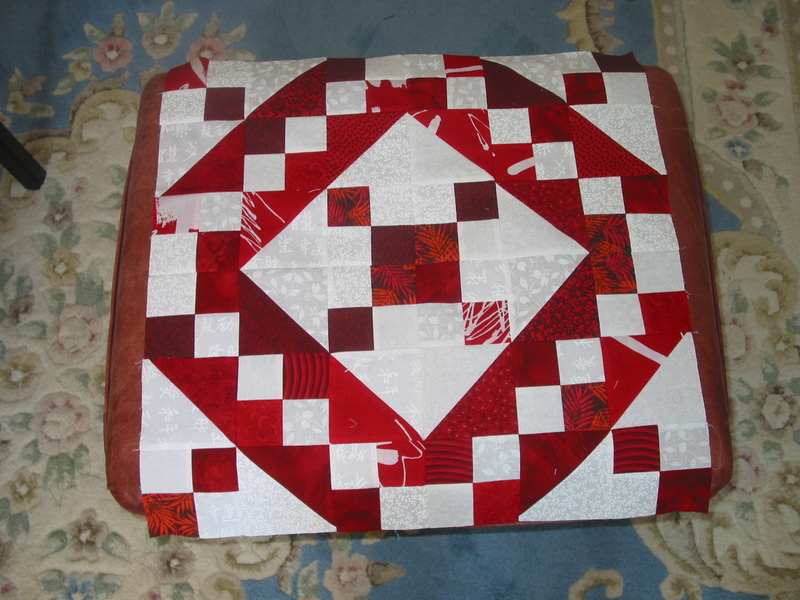 An easy block to put together. Her other kits were great and we will have some wonderful quilts once they have their borders and are quilted. And finally my brown finish for this month. It all came from stash. The diamond pattern is from Mary's Quilts page. 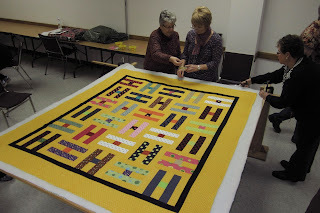 The strings are sewn on rectangles that start at 7" by 10". The big thing to remember is that half the strings must lean to the left and the other half must lean to the right. 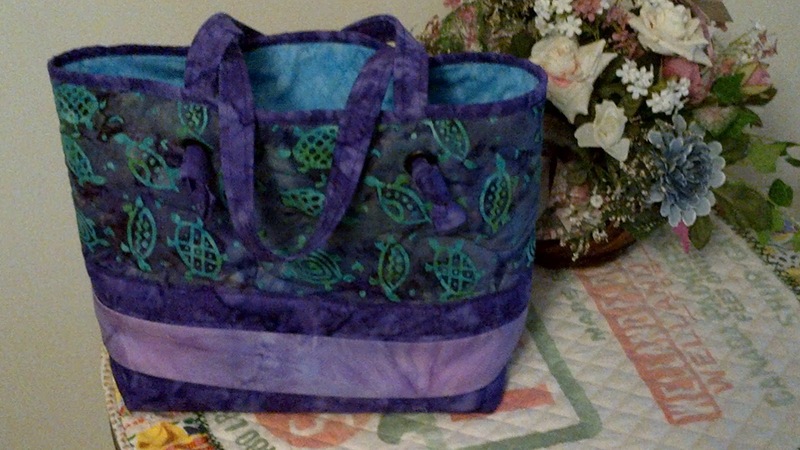 Then just sew. 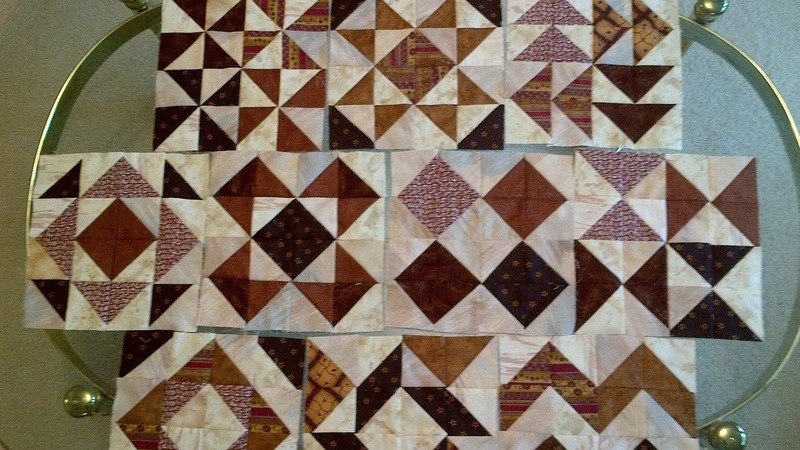 Jeni Baker at In Color Order is running a Block of the Month on her blog this year showing different ways of using Half Square Triangles to make a block. These are the first 10, only two more to go and then I can assemble them. I had these "bonus" HST left from a Bonnie Hunter project and just hope I have enough left for the remaining two months. 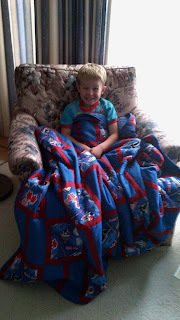 Dylan liked his quilt enough he wanted to take it to school for show and tell. His Mom convinced him that a picture of him with his quilt would be a better choice. It is Canadian Thanksgiving this weekend, so Happy Thanksgiving to those who might be celebrating. 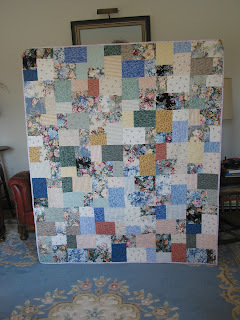 This little quilt is not quilted yet but is another scrappy one. I was reading the Quilty Pleasures blog and one of the contributors suggested making these blocks as Leaders and Enders. Well that got me started. The block components are 1 1/2" by 2 1/2" bricks. There are four of each colour. 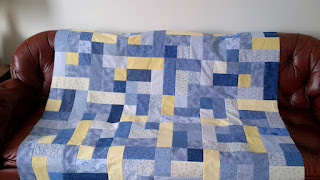 I have no repeats but there are some fabric duplicates. Once quilted it will be a Project Linus donation quilt for the Kincardine Sunset Guild. 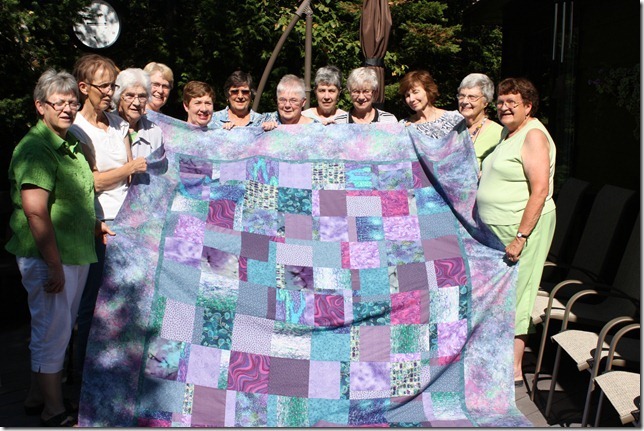 Someone gave me a milk bag full of scraps and many of them found their way into this quilt. There have been very few finishes this summer as we have been busy one way and another with family. When the weather changes and the fall routines get started we expect to have more "free" time on our hands. 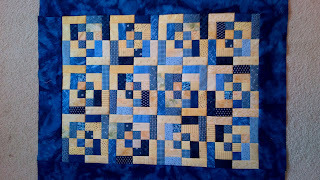 July's colour for the Rainbow Scrap Challenge is blue. I just finished this blue bento box for my brother. 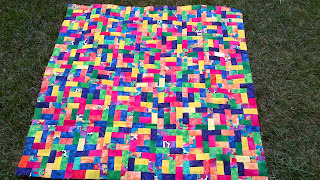 It is a lap size quilt approximately 45" square. It was started at a workshop in May so it did not take long to complete. I was given a baggie of 1 1/2" yellow squares andsome 1 1/2" strips. The next questions was what to do with them. 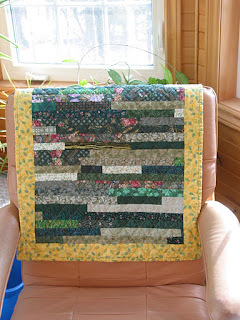 I have always wanted to try the Bento box design and Tracy Brookshier's revised pattern has directions for creating the block using 1 1/2" strips. So I used up some of the small squares﻿ andsome of the strips. I had all kinds of blue. 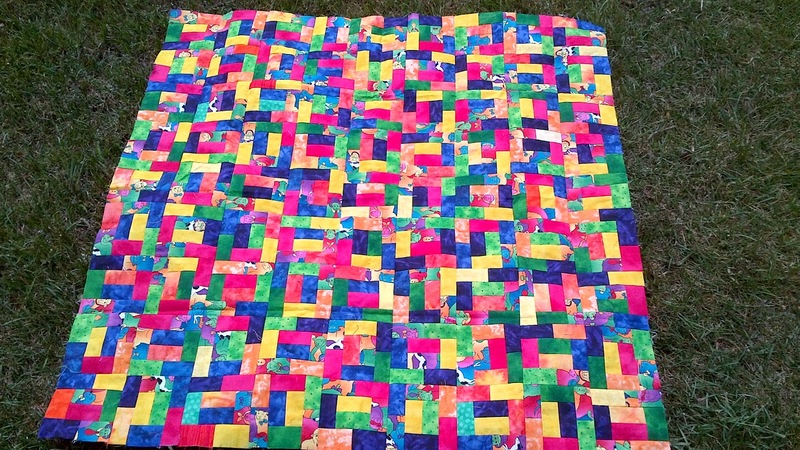 This little quilt is roughly 24" by 30". 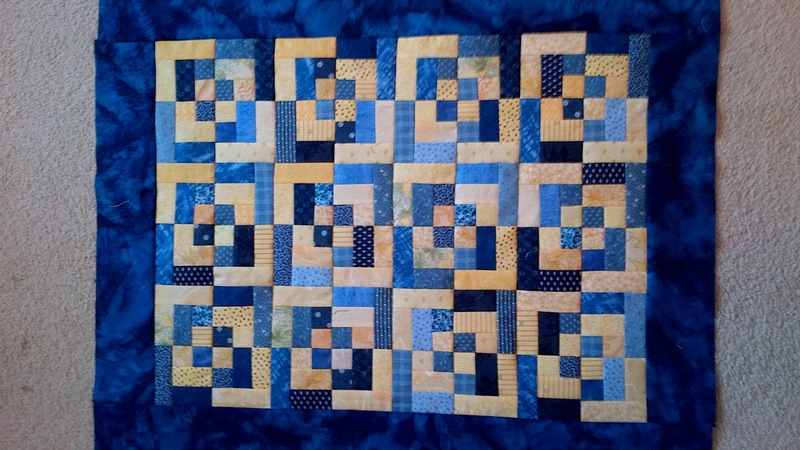 I still had all kinds of yellow squares and not as many strips so I have started working on the same size block but more of them to make a larger quilt. I attended an "official" Bento box workshop this week after making my first little one and was rather disappointed. The instructor only had one sample and it only showed one variation. 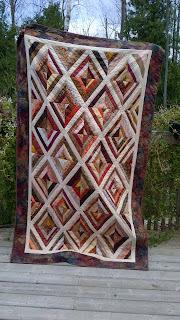 The revised pattern gives cutting directions for 5 different sizes of strips and shows several different lay outs. 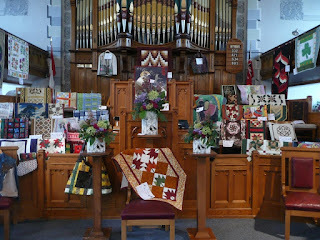 My trunk show in Kincardine went well and they asked if I would do a workshop next year. I said as long as it wasn't in the winter I would do one. Winter driving in our area can be awful or even impossible. The Hwy that goes through our town is the one that is closed most often during the winter months. 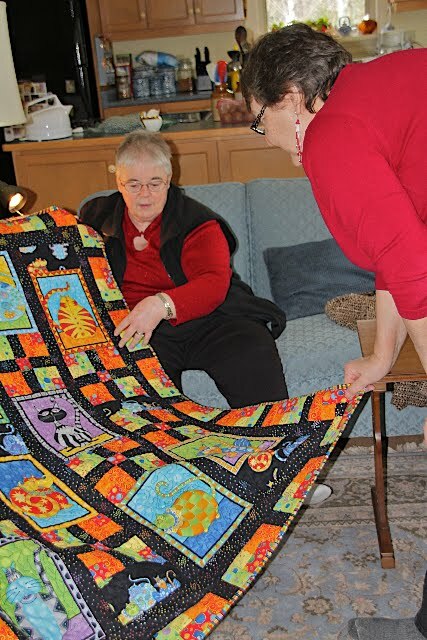 I had a great day with Kathy Wagner yesterday of the blog kathysquilts. She came to Owen Sound to give a trunk show for the Bluewater Quilters 25th anniversary and then stayed to do a workshop the following day. I had a couple of other pieces I played with but the ones on the cutting board show the scale. We got a terrific package of notes and she had so many samples for us to have a look at. My friend Jeanette drove over and back I felt very pampered. Next challenge is helping our daughter finish her move. 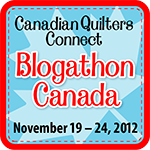 But meanwhile I am going on a short retreat tomorrow with some new friends from the Canadian Quilters On-line Yahoo group. 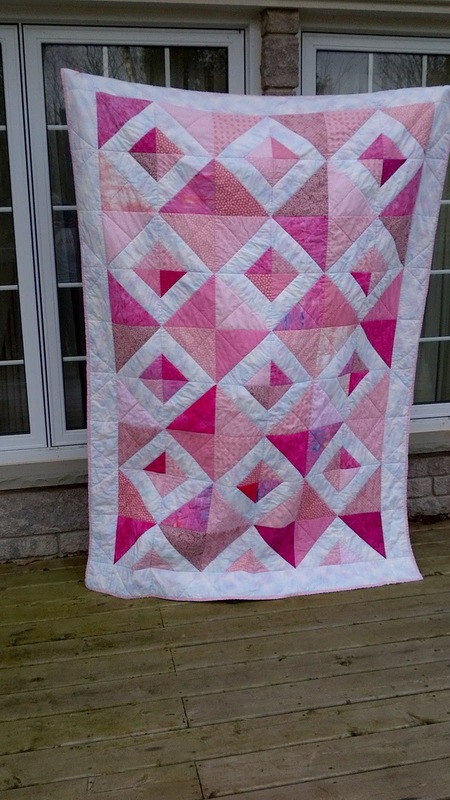 I finished this little baby size quilt recently. 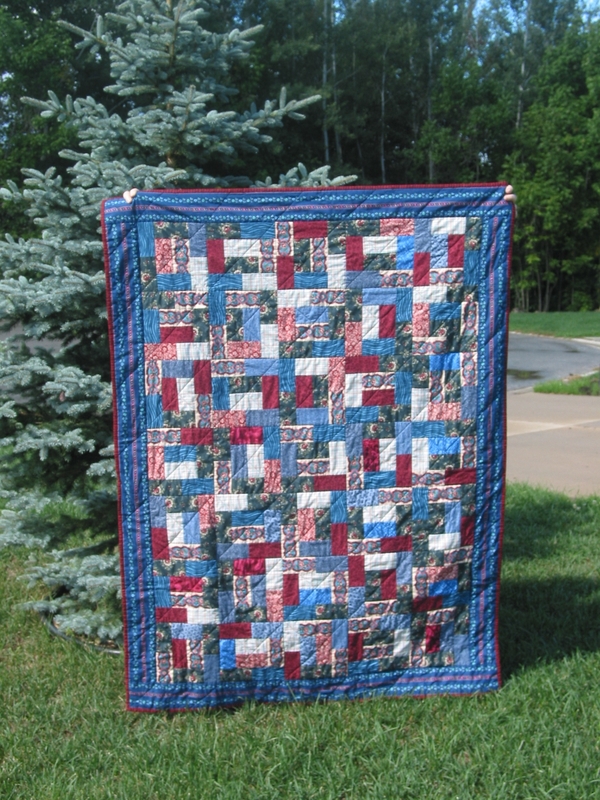 It is another double slice style/pattern. 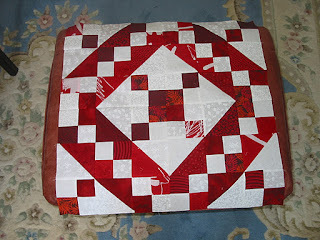 I started with 7" blocks because that is what the scraps would allow. 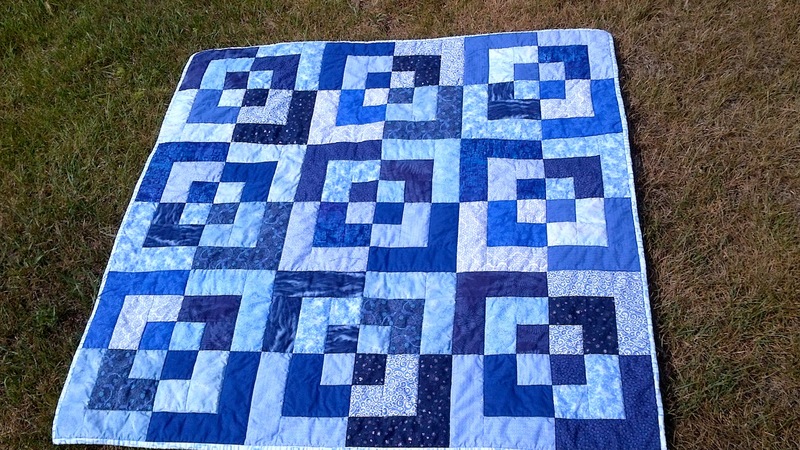 It is bright and cheerful and with a soft blue flannel backing it will keep some baby warm at night. Not many finishes recently as we have been dealing with far too many health issues and our planned trip to the Netherlands is off. 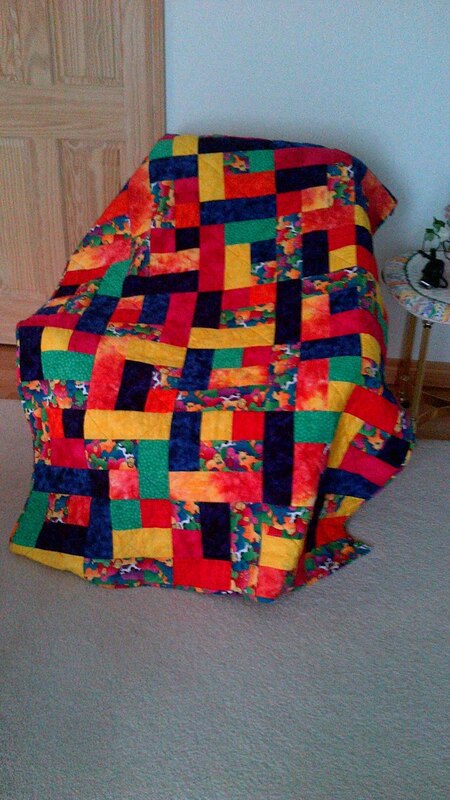 This topper is the same pattern as the finished quilt I showed in the previous post. 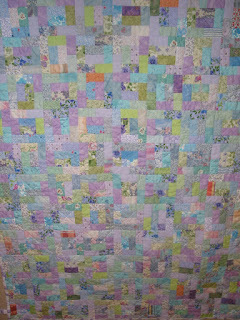 It is a Scrap Bag top and hopefully will soon be quilted and ready to donate as needed.